John’s mural is a tribute to Brugel’s painting, and is a variation to his “The Wedding Supper” Painting. He enjoyed and appreciated the Davis Mural Team so much that he wanted to pay tribute to them and to the community with this mural. In the far left lower window is the image of Pieter the Elder, to his right is an image of John Natsoulas himself, carrying a banner and leading the team. Behind him in the street is Joe Bellacera, followed by Victoria Smith. 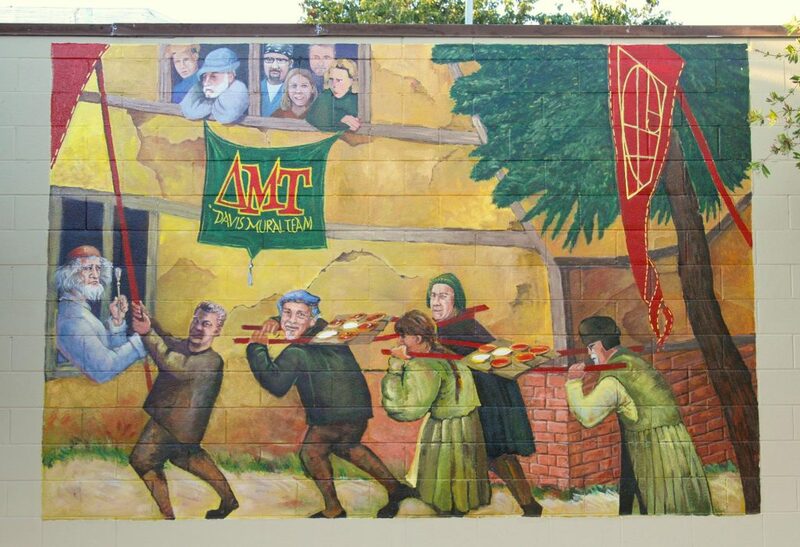 The owner of the building was so excited by the creation of the mural, he continuously visited the site, and was placed into the mural behind Kelly Detwieler’s image, carrying the pies. In the upper window from left to right, are Ted Fontaine, Bill Maul, Myron Stephens, Kerry Rowland-Avrech, Guy Diehl, and Jennifer Pochinski. This was funded by various entities, including Steve’s Pizza, The Natsoulas Gallery, and the Davis Cultural Arts Committee.